Awhile back I was walking out to my garage (the place dreams go to die) and I paused by the ’64 Sedan DeVille on jack stands sitting in front of the bay door. Like the Hammond organs, the engine on the stand, the Turbo 400 transmission, a Fender Rhodes, two different Leslie speakers, a giant Gibson guitar amp, the Cadillac project was started with the best of intentions, but faltered in the face of life. On this particular evening I opened the door, took a long breath of that old car smell and slid into the driver’s seat. I closed the door and let my eyes adjust to the darkness. The interior light blue leather and shining chrome knobs, buttons, handles, gauges, switches, but what was most beautiful was the silence, not complete silence, but a distance between me and the world. One of the kids walked by to fetch something from the garage fridge without noticing me. Why do I never hang out in here? I went inside and grabbed a guitar. The sound reverberating off the windshield was warm and sweet, I was hooked. I started taking my coffee in a Loretta Lynn’s (roadside buffet on the way to Nashville tourist trap with good fried chicken and fantastic kitsch) coffee cup and whatever guitar was close, out to the Cadillac. Ideas flowed, I talked to the line drawing of a coal miner’s daughter like she was there, a judgmental look when I could do better, an approving silence when a line or phrase would suffice. Recording was inevitable, first with my phone, then I started dragging out more equipment. A microphone stand was bungie cord rigged through the giant steering wheel. Later some cast off conference room mics were added at the corners of the windshield. Clearance christmas lights, coupled with the dirt darkened windows gave the cabin a magical glow. I could demo a few songs in here. Why not make a record? This is where some of the songs were born, why not go ahead and present them with a minimum of pretense and production? So here it is, a loose collections of songs, some conceived, all recorded in the ’64 Cadillac on jack stands in my backyard. 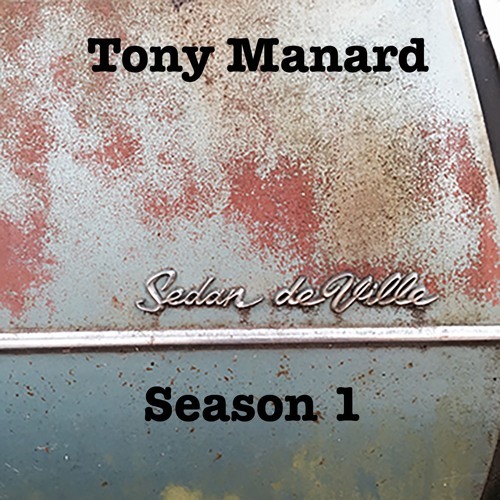 I called the collection Sedan Deville for obvious reasons, and Season 1 because there is a loose arc tying the songs together. Also because I’m lazy, I can record here in my pajamas so I will likely want to go to this well again. In my mind these are stories shared by various characters riding in the Cadillac, maybe a friend or maybe a late night hitch hiker or maybe the driver’s own internal dialogue, not a single protagonist. So grab a cup and listen for an episode or binge the whole damn thing. Welcome to Sedan DeVille Season 1.